TAKE THAT MONEY, WATCH IT BURN, SINK IN THE RIVER, THE LESSONS I LEARNED. That song!!! Every time I hear Counting Stars this book comes to mind! It could be a musical tribute to what’s going on in Our Mutual Friend. 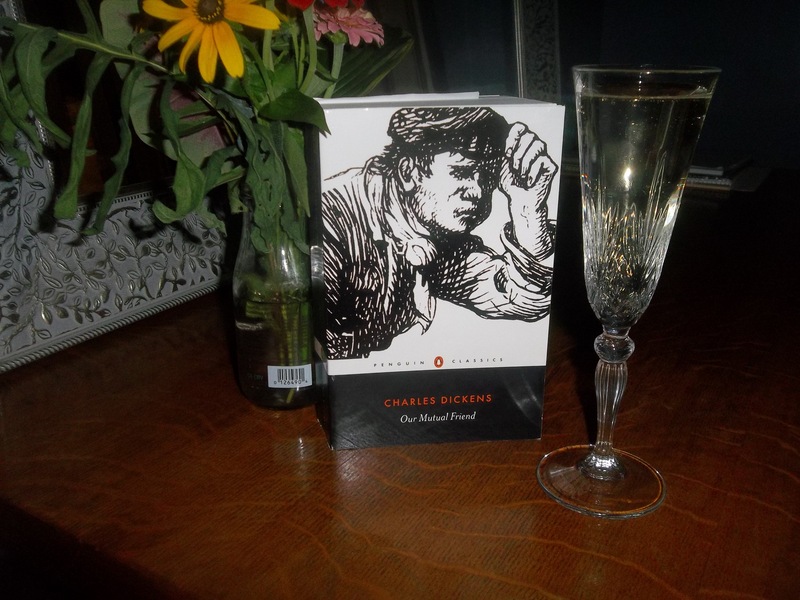 Book, Blooms from a friend and Bubbly. Celebrating the completion of my LOST reading challenge! According to LOST co-creator Carlton Cuse, there is a rumor that swirls around literary circles that John Irving, author of A Prayer for Owen Meany, The World According to Garp and other best-selling novels, says that he is saving a copy of Our Mutual Friend so it will be the last thing he reads before he dies. 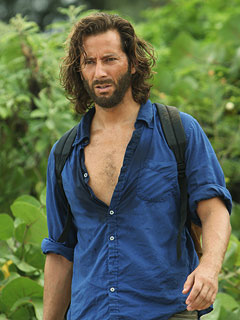 They, (the creators of LOST), took that trait and transferred it to Desmond, one of my favorite LOST characters. Easy on the eyes AND he loves Dickens. You know how some people, real or fictional, name their properties? You know, like Tara or Camelot or Biltmore or some people name their cars, their boats and other treasures? And you know how some literature can be extremely descriptive….like a boy is walking along the way but you get to read about how the sunlight is playing upon his hair and blah, blah, blah?? Well, my endurance for descriptive language has really increased in the last couple of years, and I love all things dinner party related, so imagine my joy and pleasure when I began to read all about this dining room table that was so exquisite, so massive and so precious, that Dickens spent the majority of an entire chapter describing it AND it was given a name!!! A NAME for the dining table!!! They called it Twemlow. Now I learned all about Twemlow and how many leaves it had and how many people it could seat and all the food and conversation that took place over Twemlow. And when Twemlow was not in use they would store it somewhere in the town square, I think. That part was unclear. But I just LOVED all the time and devotion given to a DINING TABLE. And then….I discovered the sad, sad, realization that Twemlow actually was a person. And he was being compared to the dining table. Sigh….so embarrassing!! But in my defense, that was in the first few chapters, before I got a hold on the story. After that, I was good. Our Mutual Friend is a scathing report on the destructive potential of wealth. At times it quite makes fun of those that are caught up in all the society, money and excess and at other times it shows the darkness and evil of those obsessed with the riches they long for. It’s also a book that brings about concealed identities and dead people being pulled out of rivers. (That happens a few times). I enjoyed experiencing Dickens’ imagination. He had some intense things going on at times and I wonder to myself, if I were living in his day, and my family sat around some evenings reading the most current installment of this story as it was delivered, would I have been on the edge of my seat? I think I would have. I also probably would have fell asleep at some point because of…ALL THE WORDS! This is one of the books I was most curious about on the LOST list. I don’t know anyone who has read it other than James at Coyote Mercury because he read and blogged the entire list a few years ago. Everyone else I talk to about it doesn’t even know it exists. It certainly is not among Dickens’ most popular works. I believe it was the last full novel that he wrote before he died. Now, you gotta see this!! Finch, formerly Ben on LOST, mentions Our Mutual Friend in this scene on Person of Interest. Ta Da! That’s it! My LOST Book Club Challenge is complete! Wow! Congratulations on completing this, and what a fitting way to end too. It’s a relief to be done but I’m sooo glad I did it! Dude, you’re using SparkNotes exactly the way they were intended. Big high five on completing your challenge! Thanks!! I feel like a Rock Star!! Congrats on finishing your challenge!!! It’s A GIANT AWESOME ACCOMPLISHMENT!!! Ha ha. Well, I’ve sort of sworn off reading challenges for a while, maybe forever. But since several of his are on my TBR list anyway, I’ll get to them eventually. I think I saw that list a few months back. Let me know if you decide to take it on.